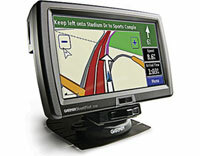 Garmin StreetPilot 7200 (010-00400-11) €0.00 including FREE DELIVERY - buy online at mysatnav.ie Ireland - FREE SHIPPING. Route avoidance - avoid motorways, tolls etc. The StreetPilot 7000 series GPS navigators are large 7" diagonal screen devices and are therefore not suitable for motor cars. They are ideal for trucks, vans and motor homes.